Endurance swimmer Lewis Gordon Pugh is attempting to become the first person to swim the length of the River Thames. The 36-year-old lawyer will start out on Monday at Kemble, Gloucestershire, and finish at Southend-on-Sea in Essex. Mr Pugh has completed a string of endurance swims and is the only person to have completed a long-distance swim in all five oceans of the world. The maritime lawyer, who was born in Dartmoor and brought up in South Africa, constantly seeks new challenges. Mr Pugh, who currently works in London, has taken up the Thames challenge to draw attention to a campaign by environment organisation WWF (formerly World Wildlife Fund) to stop climate change. "Experts predict that by 2080 or possibly earlier, the ice in the Arctic Ocean will disappear completely during the summer months unless we cut our carbon emissions considerably," he said. "If the sea ice melts away, polar bears will starve. But climate change is not just affecting remote areas like the poles. It's here on our doorstep and I feel very strongly that it's time to do what I can to help raise awareness of the issues. "I'm hoping my swim down the River Thames will bring the message home that we all have to do what we can to prevent this global catastrophe." 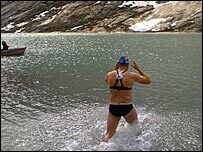 A shorter swim of the Thames was made in August 2005, when charity fund-raiser Andy Nation swam 147 miles from Lechlade, Gloucs, to Teddington, London, to raise money for the Anthony Nolan Bone Marrow Trust.